FAQ Fridays: What Are Google Store Visits and Can I See Them in Google Analytics? Every Friday, Remora's Chief Marketing Officer (CMO), Steve Seeley, is here to answer any questions you might have related to your dealership's digital presence. From tracking data in Google Analytics to website optimization and running campaigns in Google Ads, no question will go unanswered. With this in mind, let's go ahead and jump right in to this week's edition of FAQ Fridays. What Are Google Store Visits? Google store visits allow you to see how many people have visited your physical location that have also clicked on one of your paid ads. This feature actually rolled out in 2014 in a very limited beta when Google began to map out store locations and the boundaries within them. How Does Google Track People via Store Visits? 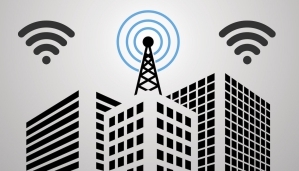 Google can connect to nearby WiFi signals, cell towers, and GPS location data to see where the user is physically located at a specific time. The store visits tool can even determine the signal strength of WiFi networks nearby to more precisely determine that person's location. For example, if this feature notices that WiFi A is for a specific store, but the signal strength is stronger for WiFi B, then Google knows the user is physically located in store B and will allocate the store visit to this location. Is Store Visit Data Accurate? When you are at a location and Google pops up with a notification on your phone asking you if you are at “Little Timmy’s Bistro,” clicking yes confirms to Google that they know your exact physical location. The same is true when they ask you to rate your experience or ask you certain questions about the business you are currently at or recently visited. What people do not realize is that interacting with these various prompts or notifications is akin to taking a survey for Google that helps make the store visit data more accurate. Time is also used to determine a store visit and make Google's data more accurate. For example, take someone who has clicked on your dealership's ad. If this person only spent 30 seconds near your location, they will not be counted as a visit since they were most likely just walking by your dealership. The same holds true for an employee; if Google sees that someone is spending a longer period of time at the location day in and day out, their data will not be passed on as being a store visit. These types of patterns are detected by Google and are taken into account when factoring in the store visits. What Are the Requirements to Be Able to See the Google Store Visit Data? Have your Google My Business account linked to your Google Ads account. 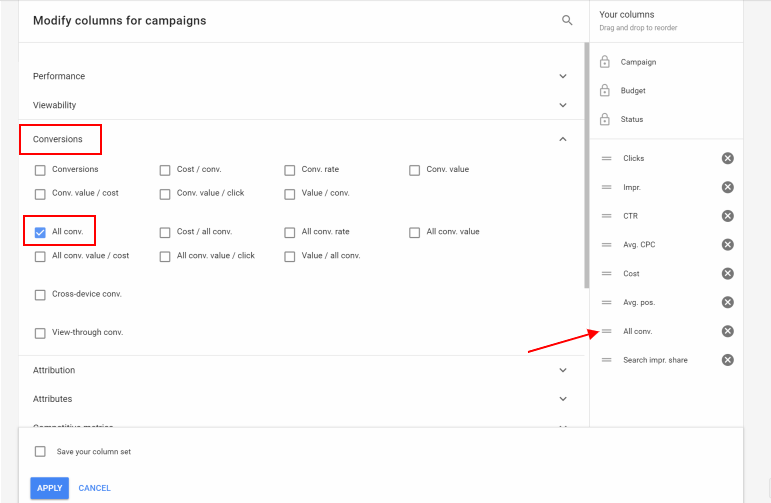 Ensure you have the location extension setup and enabled for each campaign within your Google Ads account. Meet the required ad clicks within your Google Ads account (the exact number is not known). If you are only receiving a few hundred clicks a month, chances are there is not enough data there for Google to determine the store visit counts. 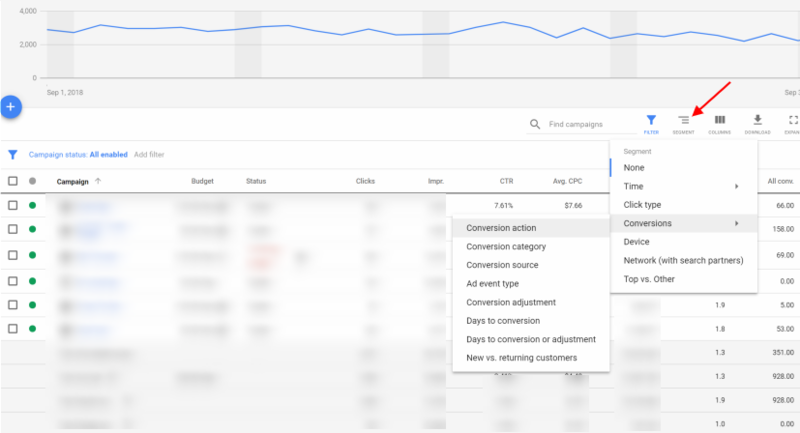 Our team does not see this data in all of the Google Ads accounts that we manage, and only the ones that are receiving enough clicks to give Google enough data to pull from trigger this feature. Keep in mind that the store visit metric is an estimate based on aggregated data. This is why Google is not able to determine your store visit conversions when you only have a few hundred clicks each month within your account. Within your Google Ads account, you will want to do the following to see if the store visit data is even available to you. 1.) From the "All Campaign" screen, click on "Columns"
2.) Select "Conversions," which will be the third section down and check "All conv." It should now populate on the right-hand side where you can drag and drop to rearrange your columns. Click "Apply" at the bottom of the screen. 3.) Now click on "Segment" (which is to the left of "Columns") and select "Conversions," then finally select "Conversion action." 4.) This will now break down all of your conversion data and show store visits if it is enabled within your account. Is Store Visit Data Visible Within My Google Analytics Account? As of the writing of this article, you unfortunately cannot see your store visit data directly within your Google Analytics account because it is not released to everyone. However, with Google's Attribution tool releasing soon, the store visits Google Analytics project has also come out of beta. This means in the coming weeks your store visit data will be reported within your Google Analytics account. This is great news as dealerships will now be able to measure the effectiveness and impact of other digital channels from outside of Google Ads. With this new data now we can really see just how effective your “in-market” email blast campaigns really are, even though none of them are producing form fills despite the fact that plenty of car dealers are unfortunately paying several thousands of dollars a month for these services.